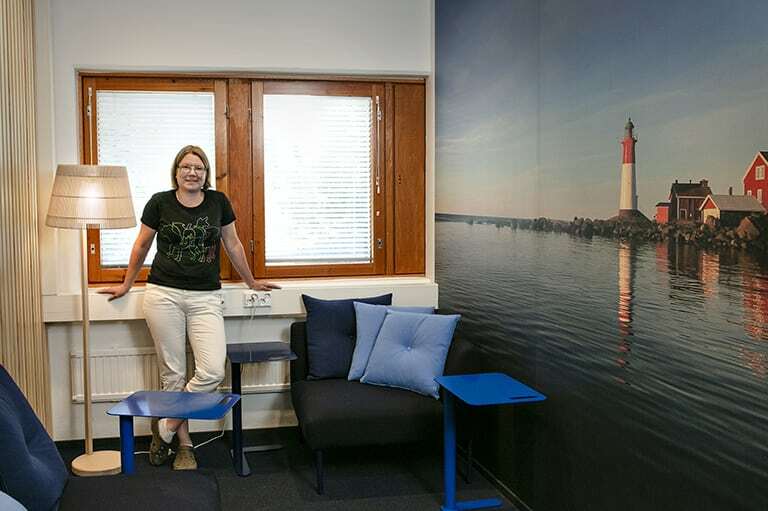 A wall covered in a photo of a summertime field, simple, modern furniture, and a fresh colour scheme welcomes Senior Scientist Riikka Keskinen to her workplace, the Jokioinen branch of the Natural Resources Institute Finland, every morning. Not that long ago, Planta, the main building of the campus, looked a little shabby. The premises displayed signs of the past decades; the furniture and colour schemes were from a time before computers, and the long corridors with brick walls were lined by numerous offices. “Planta was built at the turn of the 1970s and 80s. 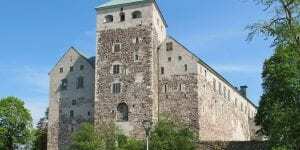 The furnishings consisted of old Billnäs furniture and period pieces, and partly of office furniture that had been acquired along the way,” Keskinen explains. Now the mismatched furniture is nowhere to be seen. Several walls were knocked down when the premises were renovated during the spring and autumn of 2017 into a modern activity-based environment. 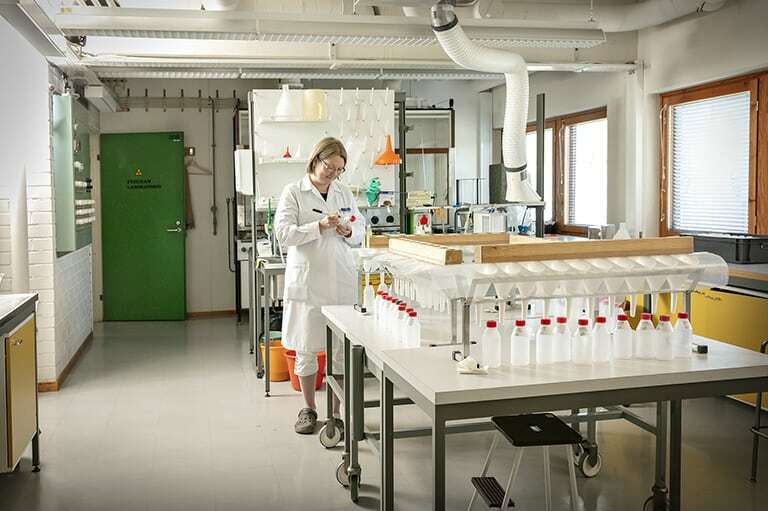 A total of 300 researchers and experts are based in Jokioinen, and 125 of them work at Planta. They were able to move into their new premises in December 2017. The premises are also used by employees who telework. 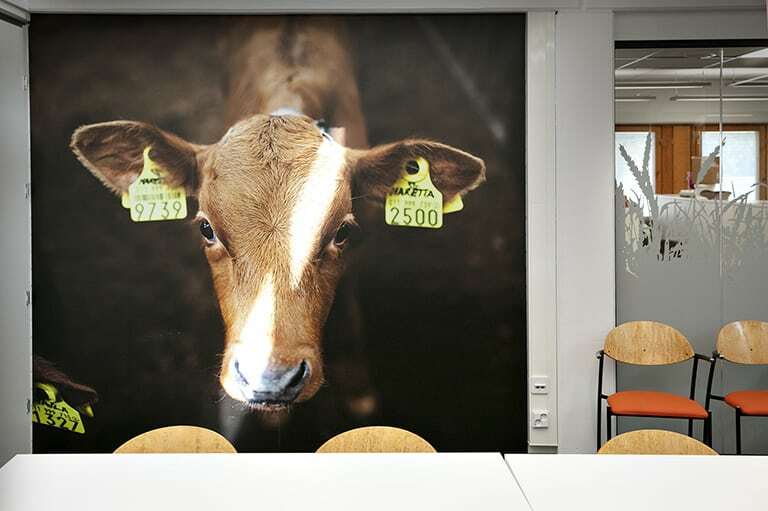 The photo wallpaper in the entrance hall and some other spaces in Planta show snapshots of the work carried out by the staff of the Natural Resources Institute and of the Finnish countryside (top). Riikka Keskinen is studying minerals in the laboratory. Not much was done to the laboratories during this renovation. A more extensive renovation is planned for the future (bottom). Riikka Keskinen has worked as a researcher at Luke and its previous incarnation MTT Agrifood Research Finland for nearly ten years. According to her the basics of a researcher’s work have not changed in the past decade, but the environment certainly has. Keskinen majored in agricultural chemistry and physics at the Faculty of Agriculture and Forestry at the University of Helsinki. Since 2009 she has been working in Jokioinen, first as a researcher and now as a senior scientist. In addition to a university this is one of the few places where extensive research into arable land is carried out. Riikka Keskinen, who was born in Turku and grew up in Helsinki, has felt at home in Jokioinen. 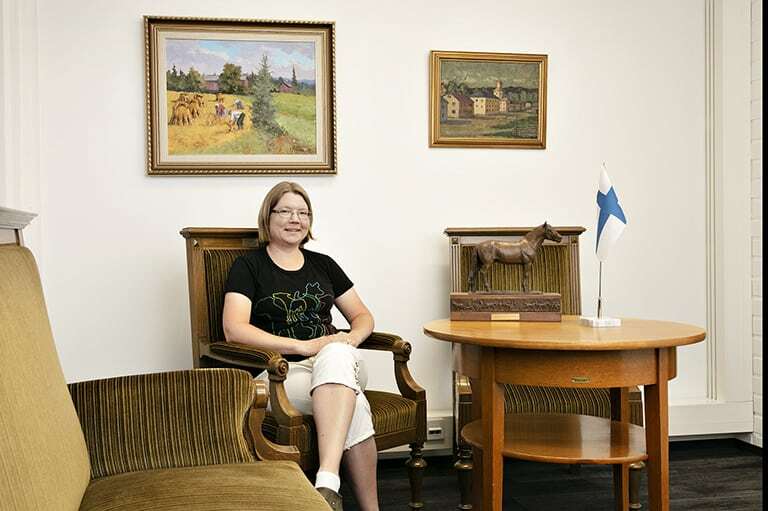 Before Planta was renovated Keskinen used to share an office with Research Engineer Johanna Nikama. The main difference to how things are now is that before, many employees used to squirrel away too many things in their numerous tall cupboards. Large piles of articles and papers also collected on the desks. 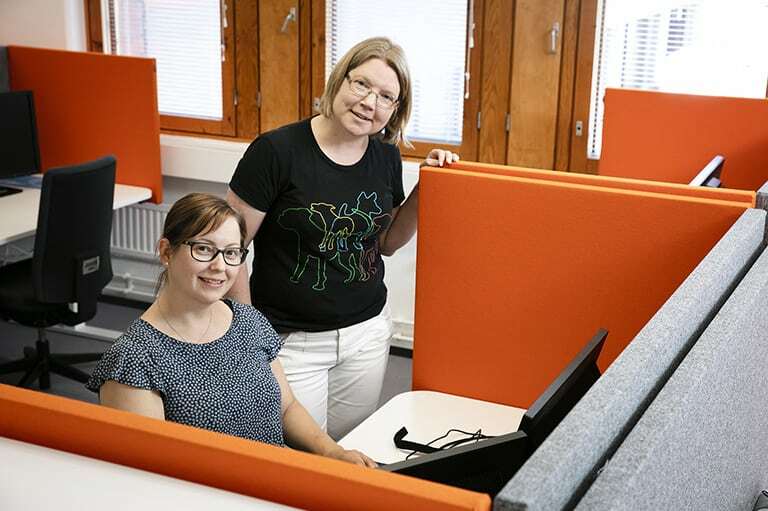 Riikka Keskinen became friends with Research Engineer Johanna Nikama (left) when they shared an office for nearly ten years (top). In the new activity-based office every employee has their own lockable storage cupboard which contains approximately five metres of shelf space. “That is plenty,” Riikka Keskinen says. Many of the pieces of furniture. including the storage cupboards, have been recycled; the grey cupboards have come to Jokioinen from the old Vallila branch (bottom). According to Riikka Keskinen, the best thing about the new activity-based environment is starting every morning with a clear desk. The offices that were knocked down during the renovation have been replaced with three larger open plan working areas, each one containing electric height-adjustable desks and chairs for 24 people. There are also several smaller areas containing work stations for approximately ten people. No one has an allocated desk, so employees can work at any free work station. In addition to the open plan working areas, Planta also has rooms for quiet work, private rooms, project rooms, a meeting room, and right in the middle there is a break room and kitchen with glass walls. 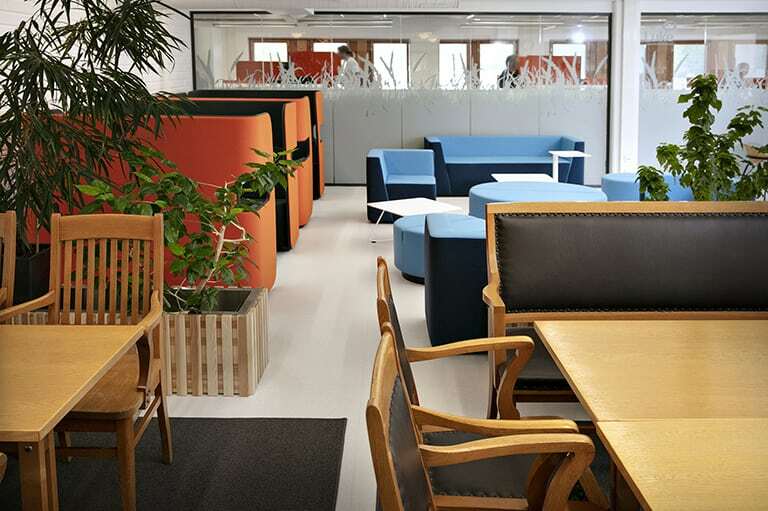 According to Keskinen the new activity-based environment supports quiet work and concentration better than the old type of offices – even though many initially worried that would not be the case. “The electric desks have made it easier to work ergonomically. 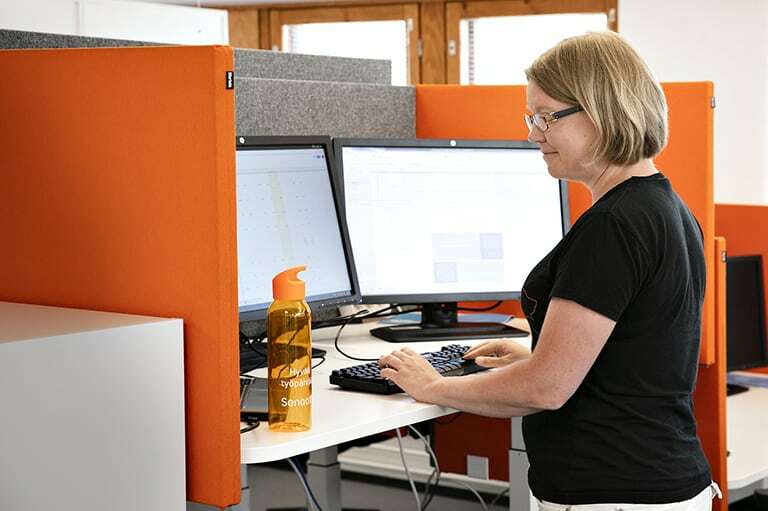 The two fixed screens at every desk are also a new thing,” Riitta Keskinen explains (top). In line with Luke’s new office concept a piece of local history has been retained at every branch. At Planta you can step back in time in a project room furnished with President Urho Kekkonen’s chair and other antique furniture (bottom). Keskinen feels that the activity-based environment has forced her to examine her own way of working. After the move in December, the atmosphere in Jokioinen has quickly become more positive. Keskinen says that working in a shared space has led to a new kind of attitude to work. Keskinen says the workplace is now more sociable as a whole. The peaceful private rooms all have different themes and identities, so people can choose the one that best suits their mood at the time. One of Riikka Keskinen’s favourite rooms is one with a maritime theme, where she enjoys sitting down on the sofa briefly with her laptop (top). The red-brick Planta represents architecture from the turn of the 1970s and 80s. 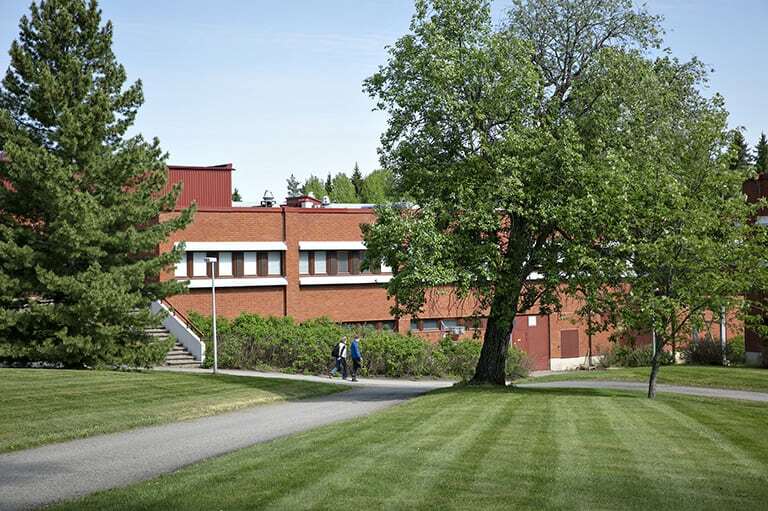 The two-storey building, located in the idyllic green campus in Jokioinen, now contains a modern activity-based environment (bottom). 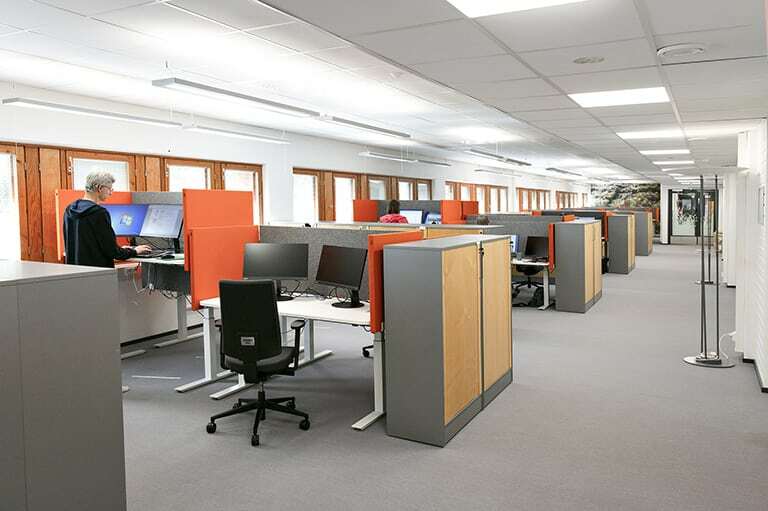 When an extensive renovation of the Jokioinen branch of the Natural Resources Institute started in the spring 2017, the main aim was to reform the ways of working and use the space more efficiently. Walls were knocked down when Senate Properties, the owner of the buildings on the Jokioinen campus, demolished the old offices and turned the main building Planta into a fresh activity-based environment. The researchers, the laboratory workers and the finance, HR and communications staff moved into the renovated premises in December 2017. “The change came from our wish to reform the way we work, but also from the Government Premises Strategy, which emphasises a move to activity-based environments and a more efficient use of the premises. At the same time we were also able to cut down on rental expenses,” explains Senior Specialist Marjo Alitalo, who was in charge of Luke’s extensive premises project. The aim to use space more efficiently also has its roots in the merger which took place in 2015. Luke was born from the merger of MTT Agrifood Research Finland, the Finnish Forest Research Institute Metla, the Finnish Game and Fisheries Research Institute RKTL and the Information Centre of the Ministry of Agriculture and Forestry Tike. Before Planta was renovated, the staff in Jokioinen were spread out in six different buildings throughout the campus. The administrative department was based in the old neoclassical main building of Jokioinen Manor, while the rest of the employees were based in the surrounding buildings. “Now the majority of our staff are based in Planta. There are still some laboratory activities and some offices in two other buildings,” Alitalo says. Marja Alitalo is pleased about the feedback she has received from the employees, who say that they enjoy coming to work in the new and light premises. Jokioinen is the Natural Resources Institute’s second largest branch after Viikki in Helsinki. Alitalo explains that the renovation of Planta was done according to a new premises concept. Luke has already completed ten activity-based offices. According to Alitalo the two remaining branches, Rovaniemi and Oulu, will be renovated according to the same concept in the near future. This feeling and identity is strengthened through the use of the fresh colours of the Luke logo, turquoise and orange, in the interior design, as well as the impressive photo wallpaper.